You have to read this book. This book about Bill. Bill Shankly, the manager of Liverpool Football Club. 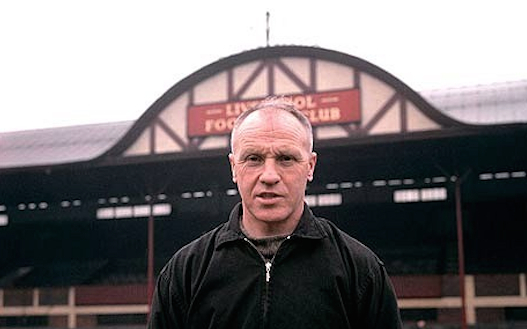 The manager of Liverpool Football Club from 1959 to 1974. All of the book is Bill. Bill is every line of the book. ‘Red or Dead’ it’s called and it all happens in Bill’s head. Through Bill’s eyes. Bill Shankly, the manager of Liverpool Football Club. David Peace wrote it and he calls it a novel but it’s pure Bill. Bill laughing, Bill running, Bill playing football. Bill playing football with the players. The players of Liverpool Football Club. The same author wrote ‘The Damned United’ about Brian Clough. About when Brian Clough was trying to be the manager of Leeds United Football Club. Bill tried to sign Brian Clough when he was a player. Tried to sign him for Liverpool Football Club. But the Directors of Liverpool Football Club wouldn’t give Bill the money. Not for Brian Clough. Not for Jack Charlton. Not for Gordon Banks. The Directors of Liverpool Football club gave Bill the money to buy Trevor Storton from Tranmere Rovers but not Gordon Banks from Leicester City. The Directors of Liverpool Football Club wouldn’t let Bill buy the best goalkeeper in the world for £60,000. Bill meets Brian Clough in this book, often. At the side of the pitch at Anfield. The home of Liverpool Football Club. And at the side of the pitch at the Baseball Ground. Bill meets Brian Clough when he is managing Derby County Football Club. Bill likes Brian and Brian likes Bill. They are both socialists. But Bill particularly likes Matt Busby, Bill’s friend and the manager of Manchester United Football Club. Bill and Matt have been friends for many years and after what nearly happened to Matt at Munich. After what happened to all the people and players who died at Munich, Bill hates flying. Flying to all the European matches Liverpool Football Club play. But Bill grips the arm rests on the plane and Bill closes his eyes and prays and Bill’s never happy ’til he’s back, home, back on the ground in Liverpool. Back with Bill’s wife Nessie where they live in Liverpool. In West Derby. Bill and Nessie live just over the road from Bellefield. Bellefield where the players from Everton Football Club come to do their training. And all through the 1960s Liverpool Football Club and Everton Football Club play against each other many times. In the League and in the Cup. Bill knows they will always be hard, hard matches. And though the crowd in the Kop, the Spion Kop, shout ‘Easy! Easy! Easy!’ Bill knows it never is. At every game Bill is there, on the bench, but in his head Bill is on the ball. Every move, every cross, every header, every tackle that every player makes for Liverpool Football Club, Bill makes too. And we are there with Bill for every match. With Bill for the games against Leeds United Football Club. With Bill for the games with Arsenal Football Club. With Bill for the five-a-sides and the seven-a-sides at Melwood with the players of Liverpool Football Club. The players of Liverpool Football Club. 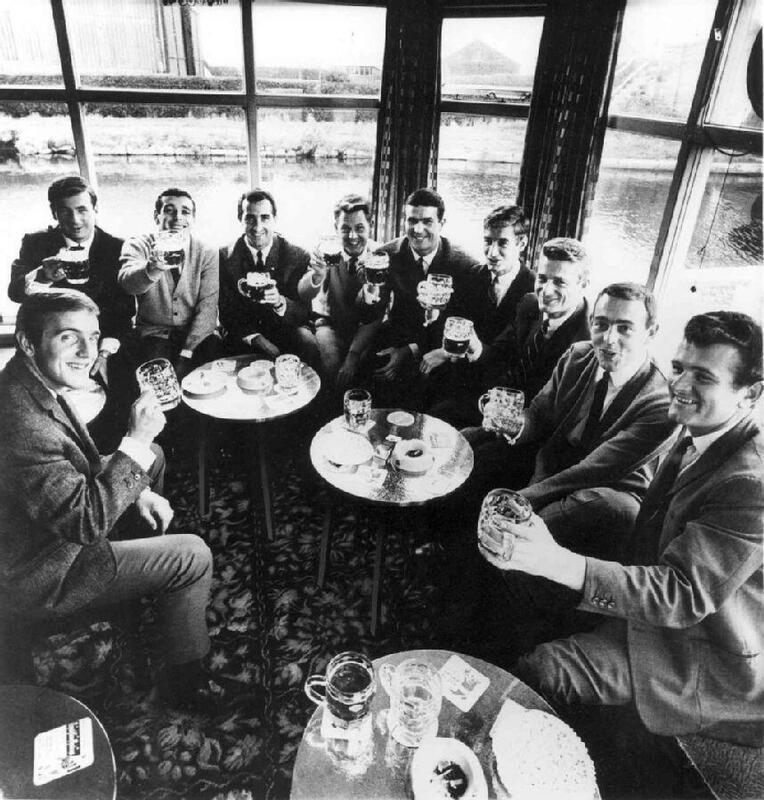 Peter, Tommy, Cally, Gerry, Gordon, Ronnie, Geoff, Roger, Ian and Tommy. Willie or Chris must’ve taken the photograph. Or maybe Bill? We see and feel every injury and every goal with Bill. When Gerry breaks his collar bone but keeps on playing. When Ian and Roger score and we win the Cup. We stand with Bill, in front of Bill and around Bill, as he tells us Bill and the players of Liverpool Football Club did all this for us. All the Leagues and all the Cups were for and because of us, the people of Liverpool. And in Bill’s office, in Bill’s office under the stands at Anfield, home of Liverpool Football Club, we are with Bill when some of the footballers of Liverpool Football Club work up the nerves to argue with Bill. With Bill arguing with Ian St John, with John Toshack, with Tommy Smith, with Brian Hall. With Bill arguing about not being picked for the team or the broken-hearted arguments when Bill tells them their time at Liverpool Football Club is nearly over. Their time at the greatest football club in the greatest city on earth. Bill Loves Liverpool. Bill and Nessie both love Liverpool. And we love them back. The people of Liverpool love Bill and Nessie. And the day Bill retires, retires from being the manager of Liverpool Football Club, because of all the pressure, from all the matches, from all the years. And to be with Nessie more and his granddaughters with scouse accents more. The City stops. Bill stops the City. Bill with us. The people of Liverpool. And Bill goes home. Bill takes off his red tie, his red Liverpool Football Club tie. And Bill goes down to the kitchen. Bill bends down and opens the cupboard under the sink. Gets out the cloths and the buckets. And Bill washes the car. Bill washes every piece of the car. Bill carefully scrubs away all of the dust and all of the dirt from the car. Then when Bill has finished washing the car Bill does the garden. And when Bill’s finished doing the garden and there’s no more work to do it’s only half past four. And Bill doesn’t know what to do. So you have to read this book. This book about Bill. Bill Shankly, the manager of Liverpool Football Club. The manager of Liverpool Football Club from 1959 to 1974. All of the book is Bill. Bill is every line of the book. ‘Red or Dead’ it’s called and it all happens in Bill’s head, in Bill’s heart, in Bill’s spirit, through Bill’s eyes. 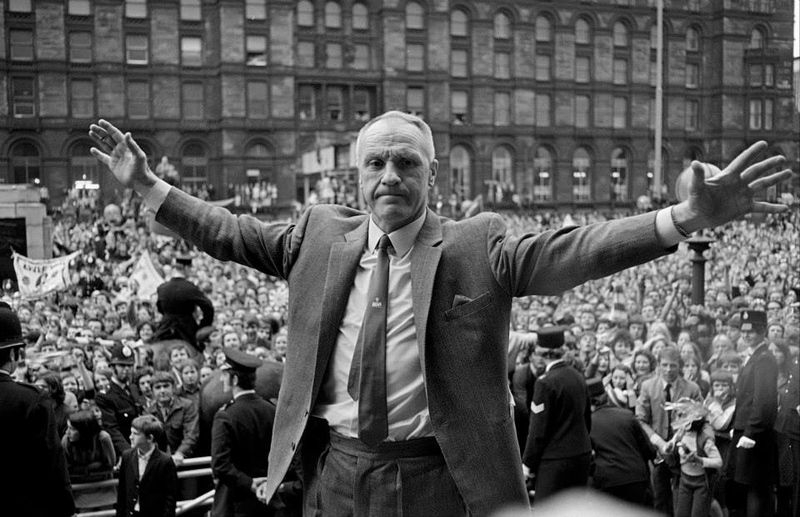 Bill Shankly, the manager of Liverpool Football Club and still its guiding spirit, the Spirit of Shankly. And none of that is a quote from the book, but that is what the book is like. A relentless red tide, attacking, defending, attacking , attacking. All through the years of Bill Shankly being the manager of Liverpool. Over 700 pages of intense energy and detail. Incredibly powerful if you’re interested in Liverpool or football and mandatory reading if you’re a Liverpool FC fan. Time and again I’d be swept up in the excitement of a forty years ago match and realise I was in the book. I was there. Thirteen years old, in the Paddock, watching the relentless red tide. I knew some of them a bit. Had their autographs. Knew they were mostly affable ordinary people really. Not when they pulled their red shirts on they weren’t ordinary. Not when they ran out onto that pitch. This is wonderful. 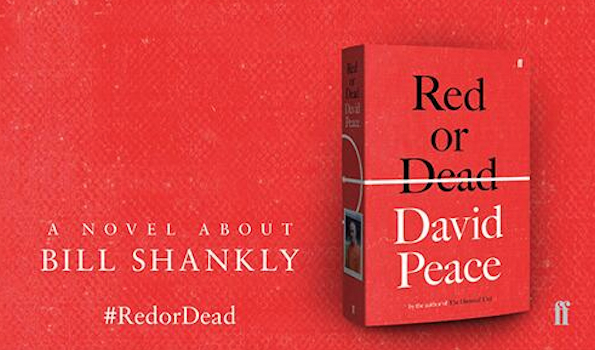 ‘Red or Dead’ by David Peace. My copy will be back in the Library before too long. Ahh, brilliant! Randomly, I’d just picked out ‘The Damned United’ from a book swap, so that’s next on my list. Hadn’t heard of this one though! Well, as you can tell, I think it’s brilliant. It is a glorious book. I’d read ‘The Damned United’ a couple of years ago and worried this might be a sort of follow up. But it’s nothing like it, except it’s brilliant. You feel like you’re spending 700 intense pages inside Bill’s head. Bill, the manager of Liverpool Football Club…And you end up thinking like Bill. Like today, this day, in Liverpool, we’ve all been thinking like Bill, thinking about Bill, thinking about winning the League. Liverpool Football Club, at last.